Attendees: Shawn, Bob T, Bob B, Tony K., Jimmy S., Gerald M., Josh P, Chris H., Dave K., Rod S., Doug J., Joe G., Mike F., Ralph G.
Day started a little before 9am. Used the plasma cutter that Jimmy brought to trim the wheel wells of my front ARB bumper. That things is like cutting butter. Got my WJ out of the way and started the real work. Mike showed up with doughnuts. Bob T arrived with a few bojangles biscuits. Then we got to work. We trimmed the front cab mounts on Dave’s FJ with the plasma cutter and then welded in filler plates to prevent the front tires form hitting the mounts when it flexed. At the same time we looked at Joe’s CB and determined it was just normal CB noise he was hearing. Rod played with the plasma cutter too on some scrap but would not get his Jeep close to the driveway, I think he was scared we would do some trimming on it with the plasma cutter. Also put Bob B’s jeep up and he dropped the skid plate and him, Doug and Rod proceeded to install his new transfer case shifter linkage. It took longer than expected and finished as one of the last projects just as the rain started around 330pm. In the middle of the linkage and between other stuff Susan went out and got burgers so Ralph showed up at lunch and grilled burgers for the team, Susan prepped tomatoes, onions, lettuce and bacon to go on it and we all sat down for 30 min or so and enjoyed some nice grilled burgers. Of course there was plenty of story telling and such during lunch and through out the day. 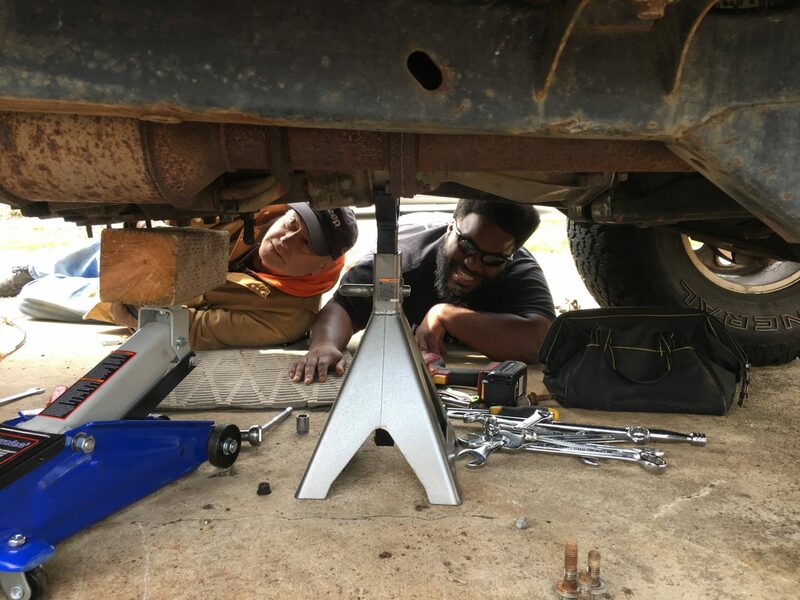 Meanwhile with Joe’s CB and Dave’s welding done we pulled in Josh’s Tahoe and looked at his rear Fender liners to see if we could do some clearancing. After some serious thinking about getting the plasma torch out we decided that was not wise. Tony tried pound on them with a sledge and in the end we decided his best route was to just add lift blocks instead of trying to move the fender wells. Yes Bob and Rod and Doug are still working on the linkage. We also used the plasma cutter to notch Bob B’s skid plate while off to allow for front driveshaft clearance. We found that Bob T. cuts with a plasma torch like a drunken sailor. I bet he was horrible coloring inside the lines as a school kid. Tony then fabbed up a short reinforcement for the cut area and welded it in. Everyone that touched the Vulcan OmniPro welder wants one. It is a nice little machine. Say what you want about Harbor Freight but they got this one right. 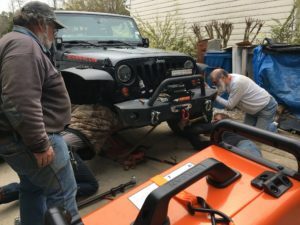 Finally we pulled Bob T’s jeep and started working on installing a currie drag link to match his currie tierod. It put up a fight. I beat on the pittman arm, Jimmy beat on it, Josh beat on it and missed and hit his hand, ice needed for that. It would not come out. I got the bright idea to swing it out and press down on it while prying on the joint with a pickle fork. So I was prying and Josh decided to stand on the drag link, it worked, but Josh has a big scrap and bruise on his shin from Bob’s bumper. Cot the new currie adjusted and back in with minimal mess. It was a great day I think we got everything done that came over. If I missed someone or something I am sorry.